Today the heavens opened up and gave us everything they've got: biblical rain, pelting winds and sidewalk graveyards of cheap umbrellas. Allow us, then, to present the Samurai Umbrella, available online to keep you dry and suggest to passersby that yes, the type of heat you pack is in fact of the sword variety. 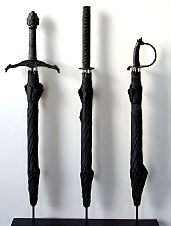 In a city where any number of crazy, unhinged characters are walking around with bags, pockets and trench coats concealing all manner of smartphones and weaponry, you'll be taking the high road: your umbrella merely resembles a sword. You'll set out in the morning with it slung over your shoulder, bandolier-style, a sheathed enigma of questionable purpose. As you charge forward toward your impending merger discussion, you'll strike fear into the hearts of villains and small children, compel admiring glances from damsels in distress and prompt attention from customer service representatives. This, again, is because they think you have a sword. As a note of caution, we don't suggest actually putting your brolly to more nefarious uses—this is New York, and sometimes the other guy really does have a sword. But let's see him stay dry with that.